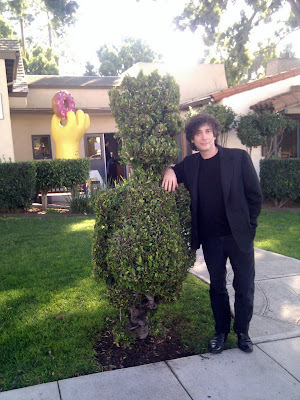 Neil Gaiman's Journal: Hey Hey We're, er, on the Simpsons. Hey Hey We're, er, on the Simpsons. I was given a copy of this. 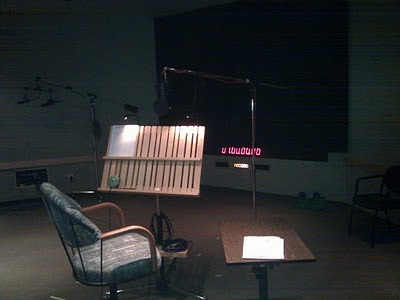 And I recorded my part here, with Producer Matt Selman directing me as hard as he could. And now, eleven months later, here we come... walkin' down the street... we get the funniest looks from... No, that's something else. Anyway, I like this shot because I am wearing a suit and tie. 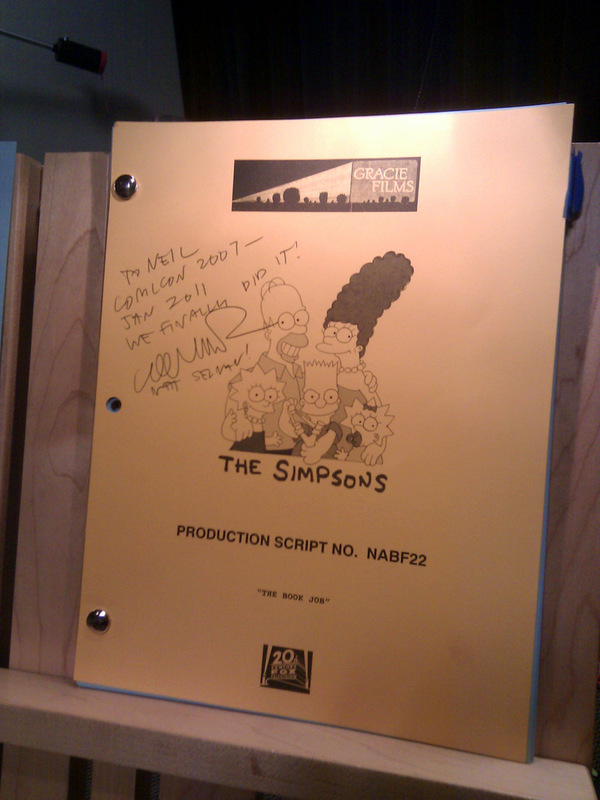 If you're in the US, then the episode of The Simpsons with me in it, "The Book Job", goes out tomorrow. 8 pm or 7 Central. If you're not in the US, then you may have a while to wait until it's on. No, I haven't seen it yet either. I am hoping to watch it tomorrow with a daughter, her friends, and probably doughnuts. I learned from Mark Evanier's blog that Les Daniels had passed away. Here's the New York Times obituary. I had Les's book "COMIX. A HISTORY OF COMIC BOOKS IN AMERICA" as a boy, and loved it and learned from it. I didn't meet Les until I was a guest at NeCon, in Providence, Rhode Island. I really liked him, I got to thank him for COMIX, and it's good to say thank you. My obsession with Jack Benny really started when Les and I were talking about radio, and I was saying that the best radio comedies were all British, pointing to Hancock's Half Hour and the Goons and Round the Horne and The Hitchhiker's Guide to the Galaxy and Les agreed that they mostly were... but then there was the Jack Benny Show. And a few weeks later, he sent me some cassettes, so I could hear for myself. And I was both convinced and hooked. Thank you, Les. Labels: Jack Benny and his Show, Les Daniels, not being crushed by The Simpsons, Topiary, Why is there no label about topiary already?